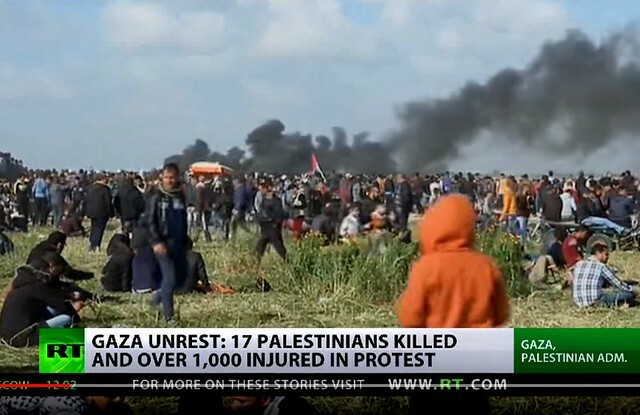 At least 17 Palestinians have been killed and over a thousand injured in clashes with Israeli soldiers at the Gaza border. Earlier, the Israeli army used live bullets, tear gas and drones against Gaza demonstrators. This entry was posted in All Posts News Politics and-or Videos, Dandelion Salad Videos, Gaza, Human Rights, Israel, Israel-Palestine-Gaza-Occupation, Palestine, Politics, Protests, Refugees, Resistance and tagged Blockade, Drones, Great March of Return, Max Blumenthal. Bookmark the permalink. Speaking in Winnipeg in Nov 2016 the radical Israeli film-maker Lia Tarachansky in a brilliant talk, among many valuable allusions, drew attention to the Naftali Bennett plan (dating back to 2012) and the tacit acceptance by Abdel Fattah el-Sisi for Egypt to annex Gaza, something I was not aware of….the segment starts @ 24:05ff https://youtu.be/EnzykvKZEaI?t=24m5s ~ but I highly recommend this entire talk, as it is so extremely cogent, instructive and enlightening…. Thanks, David. Lia Tarachansky does excellent work.